Today I hope to share some tips that will help BOTH readers – and you. Anything you do in every Finale file can be saved in a template. This includes text like composer names and copyrights, page formatting, document options, libraries of markings, and instrumentation. Whether you’re writing for a full symphony orchestra or transcribing a one-page lead sheet, you can benefit from using templates. To get you started, Finale includes several great templates for various styles and ensembles. You can use them as-is, edit these templates to your liking, or create your own custom templates. Open any subfolder to find template documents. Press the WINDOWS key + R key to open the Run dialog box. Type (or paste) %appdata%\MakeMusic\Finale 2014\Music Files\Templates and click OK.
To edit an existing template, double-click the file to open it. Press CTRL+K (Windows) or CMD+K (Mac) to open Score Manager. Add score information (composer, arranger, copyright, etc.) under File Info. Any information entered here will automatically appear in new documents created with this template. After making all your desired edits to this template, save and close it. Because any information contained in a template will be present in new scores created from it, we recommend that you do not enter any information into a template that is specific to one piece, such as a title or tempo marking. It can also be tempting to open a previously-completed score and choose File > Save As. This workflow can be especially problematic if the score was created in a previous version of Finale. Instead, begin a custom template as a new, blank score by choosing File > New > Document with Setup Wizard. This will ensure that your templates—and files based on them—maintain their integrity over time. Choose Templates from the Launch Window or File > New > Document from Template from the menu. Choose the desired template and click Open. An abbreviated version of the Setup Wizard appears so you can add additional details to the new piece, such as title, key, time, and pickup measures. Your score is created as a new untitled document, leaving your template clean for future projects. I believe it was one of the founding fathers who famously—or infamously—said, “An ounce of templates is worth a pound of scores.” Or maybe it was Scott Yoho. In any case, you will find that the practices outlined here will save you precious time when creating new scores, while at the same putting your personal stamp on them. Chad E. Mathis is a customer success manager with MakeMusic. He has been with the team since 2013. 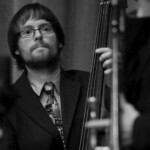 As a bassist, he brings the funk to Boulder. When he’s not holding down the low end, he enjoys making popcorn for his colleagues, going to shows, and listening to the Beach Boys’ Pet Sounds.